3 for $183.00 total Need more quantities? The semidouble blooms are lavender and 8″ across, sometimes showing yellow in the middle. Tree Peonies grow best in full sun or partial shade (required in the South and warm areas of western Zone 9) and evenly moist but well-drained soil with a pH close to neutral. They take a year or two to show what they can do, but are more than worth the wait. For more information on Tree Peony care, click Growing Guide. I have almost 30 tree and herbaceous peonies on a hillside and this is my favorite. The bloom color is unique among peonies, and it blooms freely in half sun. Tree peonies have an undeserved reputation for being hard-to-grow, but they are no more difficult than the herbaceous sorts and by combining the two, the peony blooming season can be greatly lengthened. Tree Peonies are magnificent, long-lived woody shrubs that no garden should be without. Some varieties reach 4–5′ in height and plants are capable of bearing fragrant flowers to 10″ in diameter. Tree Peonies thrive in areas with cold winters and hot summers and do very well in the Northeast and Midwest, and are hardy from Zones 4 to 8. Gardeners in Zone 9 can enjoy Tree Peonies by forcing the shrubs into dormancy: trim off all foliage in November, leaving the woody stems, do not water or fertilize, and with luck the plant will form flower buds. Tree Peonies are not plants for the impatient gardener, as they may take 3 years to become established and flower. Bear in mind, also, that the flowers of a new plant may not reach their potential for several seasons. That said, there is absolutely nothing like a Tree Peony in full bloom; such a sight is breathtaking. Tree Peonies need some time to settle in before they bloom; it's not unusual for a plant to wait until its third spring before it flowers. In addition, Tree Peonies are often slow to break dormancy the first spring after planting. Your plant may look dead while its neighbors are springing to life, but it will awaken soon enough. Light/Watering: Light shade from hot afternoon sun is necessary to protect the flowers, and in China and Japan small parasols are set over the plants to block the sun. Plant Tree Peonies where they will be protected against drying winds in summer and winter. Tree Peonies are very drought tolerant once established. Do not overwater and do not plant near an automatic irrigation system. Wait until the soil has dried down to 4″ before watering deeply. Watering too much will kill the roots and is a common reason for failure. Fertilizer/Soil and pH: Tree Peonies need a well-drained soil with a pH close to neutral or a bit above. If your soil is acidic, add a few handfuls of lime at planting time. Plant at the depth indicated by the green plastic ribbon wrapped around the main stem, and remove the ribbon after setting the plant at the right depth. If the ribbon has gone astray, plant the top of the graft union (which appears as a bulge on the main stem) about 4–6″ below the surface of the soil to encourage the scion to form its own roots. Topdress plants in spring with an inch of compost or aged manure. A foliar feeding with fish emulsion is appreciated during the growing season. Pests/Diseases: On rare occasions you may notice a hole in the woody stem, caused by a boring insect. You may be able to kill the larva in the tunnel using a thin wire, or simply cut out the affected area. Like Herbaceous Peonies, Tree Peonies are occasionally afflicted with fungal diseases that cause black spots on leaves and wilting of shoots. Remove any diseased foliage as soon as noticed and be sure to clean up all fallen plant parts in the autumn. If fungal diseases become a problem, spray with a fungicide early in spring, repeating the treatments for several weeks. Be diligent with deadheading and do not allow fallen petals to remain caught in the plant or on the ground. Companions: Hellebores , Alchemilla, Leucojum, Epimedium and Siberian Irises are all lovely in combination with Tree Peonies. If your plants tend toward legginess, underplant with spring-flowering bulbs. Pruning: Never prune Tree Peonies back to the ground as is done with their herbaceous relatives. Prune out any damaged or broken stems after plants leaf out. Once your plant has some age and is growing vigorously, you may want to open up the center a bit to encourage flowering on the taller stems and increase air circulation. 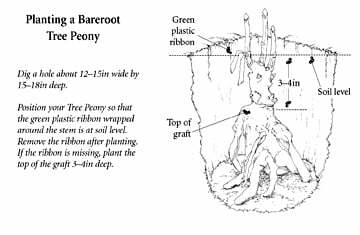 Tree Peonies are grafted onto Herbaceous Peony roots and occasionally a shoot from the rootstock will arise from the base of the plant. These should be removed immediately. Dividing/Transplanting: Tree Peonies do not need to be divided, and with many plants this is impossible. Young plants may be moved when dormant; dig the plant keeping as much soil around the roots as possible. End-of-Season Care: Remove all foliage after a killing frost, including leaf petioles; discard away from your garden area, not in the compost pile. New plants should be mulched, and in the coldest areas should be wrapped with burlap or another material to protect from winter winds. Early Spring: Topdress plants with an inch of compost or aged manure. Watch for signs of fungal disease and treat as needed. If a shoot arises from the rootstock, remove it. Mid-Spring: Some varieties may need support for the heavy flowers. If the interior of the plant is crowded with foliage, thin it out to improve air circulation. Late Spring: Do not overwater. Be diligent with deadheading spent blossoms and remove old flowers and petals from the garden. Summer: Only water plants when soil dries out to a depth of four inches, and then water deeply. Foliar feeding with fish emulsion is appreciated. Fall: Do not prune Tree Peonies back; they are woody shrubs. Remove all foliage after frost, but do not compost. Mulch new plants and those grown in the colder zones, and if cold winter winds are expected, wrap plants with burlap or other protective material.